It was all about the pig. Floyd found it on his property, but Randolph insisted that the pig was his from the markings on its ear. The whole matter was taken to the local preacher to sort out. The preacher took six people from Floyd’s family and six people from Randolph’s family. But in the end, Floyd got to keep the pig. The deciding vote was cast by Bill, a relative of both Floyd and Randolph. Shortly thereafter, Bill was found dead. His killers were acquitted. Sound like the script from a movie? Well, sort of. The feud has made its way into many films and television shows. It’s famous. Floyd’s last name was Hatfield and Randolph’s last name was… Can you guess? … McCoy. In the early 1800s two men from Ireland settled in and around Virginia. The McCoy family found a home on the Kentucky side of the Tug Fork tributary to the Big Sandy River. The Hatfields settled on the West Virginia side. They lived in peace until the Civil war broke out. Then Asa Harman McCoy joined the Union army. After he was sent home with a broken leg, he was threatened by the Hatfields. When he was killed, it was assumed that the Hatfield’s had done it. But the case never went to trial because apparently the McCoy family thought that Asa Harman McCoy had been a traitor by joining the Union Army also. 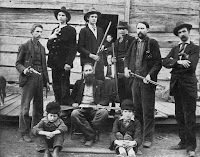 Thirteen years of peace ensued between the Hatfields and McCoys. But the pig changed all of that. Once Bill was found dead, it became an all out war. Over the next thirteen years the feud claimed over a dozen members from each family. It was the headline news around both states and the Governors of Kentucky and West Virginia needed to call in the militia to restore peace. And all the death and destruction started because of one little pig. The whole thing could have been avoided if they had been able to settle their differences before it spiraled out of control. But sin is like that. Sometimes the little sins we do, if left unchecked, can spiral completely out of control. The best road is the high road. Jesus said turn the other cheek. Let the spiral stop with you. “But that’s unfair”, you claim. Well, life’s not always fair. If life was fair, God would not have stopped the spiraling relationship between God and Man. But He did. He sent His only son to come into the world to break the spiral and restore peace. The Hatfields and McCoys are supposedly the inspiration of the television game show, “Family Feud”. In fact relatives of both families played on the show in 1979. Can you guess what the prize was? That’s right. A pig.